Welcome to Maysonbrook. The passing of time and the creation of shared memories is central to what we do. Time, how we spend it, and who we spend it with is what life is all about, and here at Maysonbrook, it’s a precious passage, worthy of celebration. 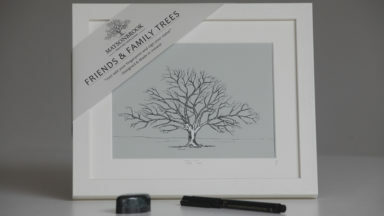 We are the makers of Maysonbrook Friends & Family trees, a beautiful, personal way to cherish the memories you and your family make together. Bernadine Burke is the founder of and principal artist behind Maysonbrook. Bernadine is an artist, designer, and teacher. She holds a degree in Fine Art from GMIT, Galway, Ireland (2004), where her work received the Graduate of the Year award. 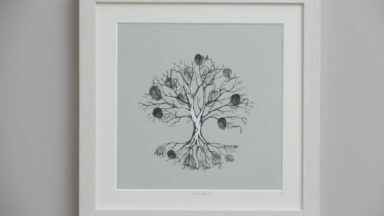 She also has a higher diploma in Art & Design education from Limerick School of Art & Design (2005). Bernadine’s inspiration for Maysonbrook comes from the beautiful mature trees in the lush fields around her family home in Masonbrook, Galway. 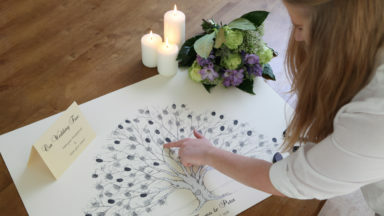 She had seen and liked the concept of fingerprint trees before but felt the need to reimagine them in an elegant, Irish and hand-crafted take – and so Maysonbrook was born.